As expected, training is extensive and essential for 12+ months working in the Sub-Antarctic or on the Antarctic continent. 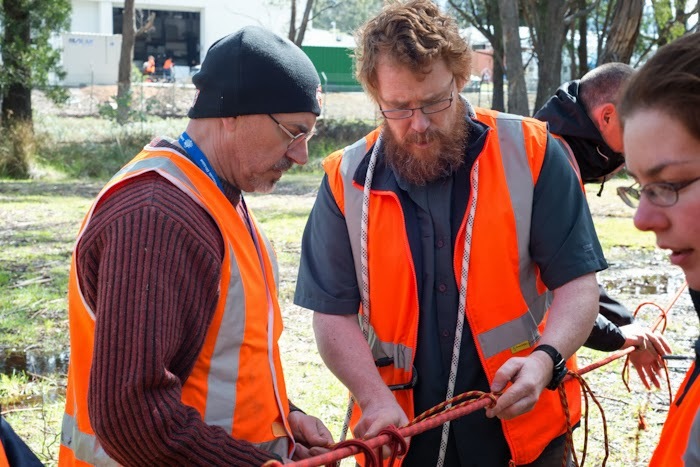 Typically a new expeditioner needs to complete around 3 months training in Kingston near Hobart before departing to undergo more training on location at whichever station they may be going to. Since I am a ‘repeat offender’ my training program has been modified slightly from the norm. I am still doing courses relating to my job like refreshers on Hydraulic systems, Caterpillar plant repair and maintenance and Chainsaw operation (yep, Chainsaws!.. Don’t tell anyone there are no trees down there..) And then there are other courses relating to being a valuable member of the ‘Antarctic community’ such as sessions on managing conflicts and other situations which may (and quite often, do) occur down there. We also do a fair amount of Fire training, ERT (Emergency Response Training) and SAR (Search and Rescue). Here are the some of the lads getting a talk from FTO (Field Training Officer) Simon on stylish ways to wear helmets and harnesses! And FTO Psycho showing Mark the easiest way to granny knot one piece of rope to another. This year I was lucky enough to be offered a chance to do a fairly unique training program. 99% of the time we only have one Doctor on station so four winterers per year are selected to be ‘Lay surgical assistants’. Two will train to assist with anesthetics and the other two train to be Scrub/Scout nurses. 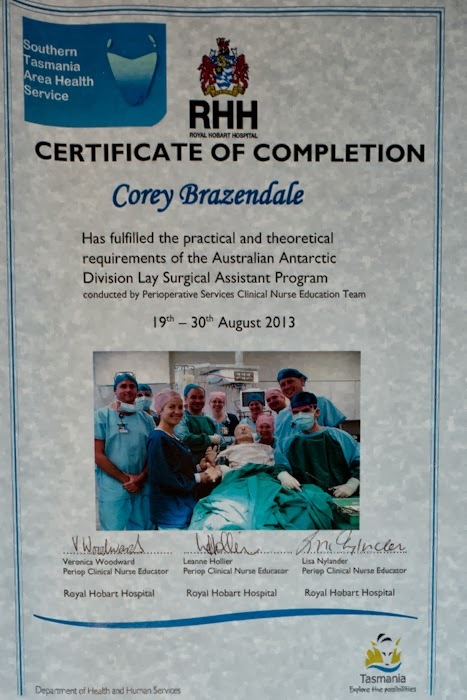 The course takes place over two weeks at the Royal Hobart Hospital and is comprised mainly of being part of real surgeries in their operating theaters! I was bestowed with the honor of being a Scout and sometimes Scrub nurse through numerous operations such as a Bone marrow biopsy, Scleral grafts, Gall bladder and Appendix removals, Quadruple heart bypass, a bit of Pediatric stuff like a PICC line and a few other things which probably don’t have a time and place to be spoken about… Overall the Lay surgical training is probably one of the most confronting but rewarding training I have ever done and I am very grateful to have had the opportunity to be a part of it. 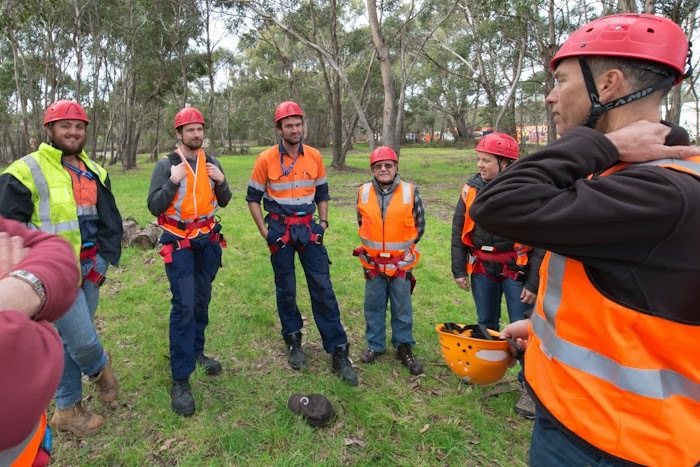 We only have Fire training and a bit of pre-departure stuff left to go here before boarding the Aurora Australis to start sailing south again! Exciting times!